Oak Flats is a single-platform intercity train station located in Oak Flats, New South Wales, Australia, on the South Coast railway line. The station serves NSW TrainLink trains travelling south to Kiama and north to Wollongong and Sydney.Premier Illawarra operates connecting bus services from the station to Albion Park, Shellharbour and Wollongong. Together with the Dunmore and later Shellharbour Junction stations, Oak Flats has long served as the rail connection for the coastal suburbs of the City of Shellharbour. The railway reached the area in 1887, when the South Coast Line was extended from Wollongong to North Kiama. 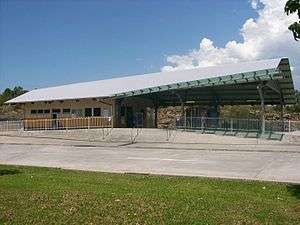 Initially stations were only provided at Dunmore and Albion Park – although Albion Park Station was known as Oak Flats until the following year. Local politician and sometime Premier of New South Wales George Fuller was a prominent landholder in the district – his father had named Dunmore – and in 1921 he subdivided some of his land at Oak Flats, on the southern shore of Lake Illawarra. The development of a residential area over the next few years spurred the NSW Government Railways to build a station for the new subdivision; this opened in 1925. The original station featured a single wooden platform and small, skillion-roofed weatherboard waiting shed.